I am in the preliminary stage of looking into a tandem island purchase. Does anyone have a recommendation on a trailer for this model? Thanks much! We have a custom designed Trailex trailer for the Tandem Island. 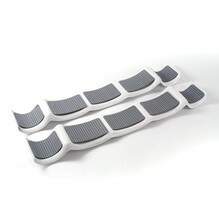 What Matt suggested may not be the most inexpensive solution, but it is the best by miles. The trailer is sprung "soft" enough protect the boat on the highway and pulls easily. If needed, you can unhook it from your car and roll it to the water by hand - it's very light. It simply "fits" the AI/TI boats better than anything else. It won't rust or corrode. However, I would skip on the cradles and just go with PVC bunks. We have noted some issues with bunks running along the scupper crease. This has been shown to push the floor up in some models. Various, but you can see if the floor is level. The scuppers would start to look like volcanoes (mountains) if it is happening. Personally I think the best overall solution is a combination of cradles and bunks for best support if you are concerned about cradles not offering enough support. The cradles oil canned my TI and they only lasted 1 season before becoming brittle and cracking (boat and trailer were stored in garage). Additionally, they made getting the TI on and off much harder than PVC. No offense, but I just don't think they are worth what Hobie charges for them. Here is my baby on the trailex with the TI cradles​. Aren't you supposed to strap the amas separately from the main hull to reduce rubbing? Could this trailer/dolly setup be made to work with a Tandem Island? What I am wondering is if the specific trailer/dolly that Hobie lists in their catalog for the PA17 can readily be adjusted to fit a tandem island? Last edited by itiming on Sun Apr 22, 2018 8:16 pm, edited 1 time in total. That dolly/trailer is really clever, I havn’t seen that before. I see no reason you couldn’t add that feature to any TI trailer, just a couple U hooks or something for the cart to drop into. If I had ever seen one I would have added that feature immediatly to my trailer, really clever. The trick on PVC cradles on TI’s is to use small dia PVC tubing, (pretty important). I think I used 1 1/4” dia schedule 40 PVC. I then slid standard 3/4” dia broom handles into the pvc to make it stronger. With the boat on the cradles you want no more than an inch or so between the lowest points on the boat and the trailer bed. I think you need at least 3 or 4 cross bars to provide an even load for the boat to rest on. We just taped insulation onto the outside rails for the AMA’s to rest on. The PVC tubes need to stick out beyond the back of the trailer at least a foot, (this automatically aligns the boat when trying to load in a crosswind). We also added a roller at the back of the trailer, (between the pvc rails). We also added a boat winch which really helps. Worked for us really well over 4 yrs with no issues. I agree the trailex trailers are way better than anything we ever had. The PVC rails are way easier to load/unload the boat, at the boat ramps, you just take the strap off and the boat falls in the water, (a good idea to have a bow line in your hand, (yea it can get away from you). Looks like Hobie's trailer "38652001 TRAILER HOBIE ALUM KAYAK TI" will have the TI hanging almost 4' from the rear cradle. I'd like to transport my TI fully rigged with a live well and other safety gear stashed in the rear. I'm worried Hobie's trailer won't have enough support with the added weight and was thinking about ordering SUT-350-S instead. Would love to get some input from the crowd. I have similar concerns about the Hobie TI Trailex trailer being too short, not providing enough support. We plan to go to Lake Havasu City in the spring and heat can be a big issue, perhaps causing the TI to sag. At least that's what a Hobie dealer warned me about. 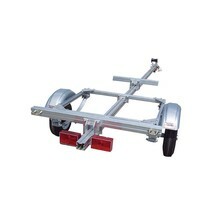 that the trailer used is very similar to the ProAngler 17T Trailex trailer: longer with the PA17T rollers on the back. Interesting that it wasn't the official TI trailer. Like several others have noted, if the Hobie TI Kayak Dolly could be hooked to the rear like the PA17T's, this would seem to be a winning combination for the TI, providing perhaps a third cradle for support. 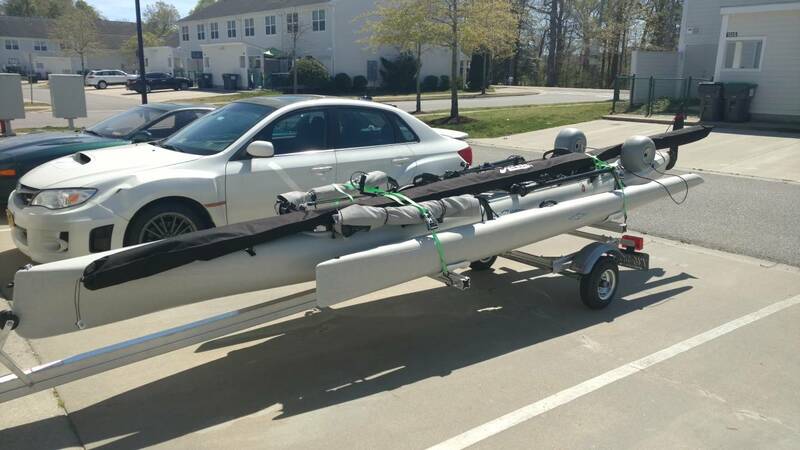 If I ordered a Hobie TI trailer, not sure which one would show up.